Diese Website benutzt Cookies. Wenn Sie diese Website weiter nutzen, wird Ihr Einverständnis vorausgesetzt. Näheres entnehmen Sie bitte der Datenschutzerklärung. This site was created many years ago. In the meantime, the autor married and changed his lastname from Schroeter to Fiddike. He offers Scrum trainings in English and German (Scrum Schulung) and often goes to Scrum Usergroups in Berlin. If you know the author and want to catch up, please connect via LinkedIn or Xing, both profiles are linked from fiddike.com. For the curious, the original content of this page has been preserved below. 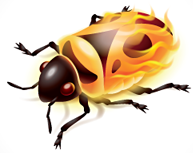 When we started to develop ie4mac, because we saw a need for it, we couldn't know that three competitors had a similiar product in the pipeline. Two of them launched before we did and on of them had a large userbase from a previously offered automated testing tool. At that point in time we decided to abandon development of ie4mac. Ever since Microsoft stopped developing the Internet Explorer for the Mac in 2003, web designers have been faced with a dilemma: While many designers choose to use Apples' Mac computers, most of their customers are still using Windows. A large fraction of them uses the Internet Explorer. They are ready to pay for website designs that render correctly in this browser, so web designers need a way to verify their designs in IE. But many web designers don't want to spend their valuable time to set up and maintain Windows on their Macs. Furthermore, they don't want to pay 200 $ or more on licenses for Windows and Parallels Desktop just to have the Internet Explorer on their Mac. 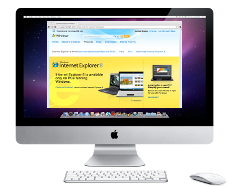 With ie4mac you can use the exact same Internet Explorer that your customers are using on Windows. In fact your are using the original, unmodified Windows Internet Explorer, right on your Mac. ie4mac makes this possible by running a cluster of Windows Servers and delivering the Internet Explorer to your Mac using a protocol called RDP. This way we can provide you with four different versions of IE, running side by side, namely Internet Explorer 9, 8, 7 and 6. Furthermore, developer tools are included. Legal Disclaimer: ie4mac was a product of Market Valid GmbH & Co KG. It is not associated with nor endorsed by Apple Inc. or Microsoft Corporation. Mac and Mac OS are trademarks of Apple Inc., registered in the U.S. and other countries. Internet Explorer and Windows are registered trademarks of Microsoft Corporation in the United States and other countries. Linux is a registered trademark of Linus Torvalds. All other trademarks, trade names or service marks are the property of their respective owners and are used for identification purposes only.